One of my favorite things about warmer weather is all the fresh produce that comes with it. Since we move so often, I haven’t been able to have my own garden. Russell and I are moving once again in just a few short months and we plan to be in our new location for the long haul. We have already been planning our garden for next year, tomatoes, zucchini, cucumbers, peppers, the list goes on and on. In the meantime, we have been enjoying the fresh produce from the local farmer’s market. I have never been a big fan of sun-dried tomatoes. Most of the ones that you buy in the store are dry and leave me wishing they were more flavorful. After I picked up two containers of grape tomatoes, I began to wonder what I was going to do with them other than the obvious answer of eating them on a salad; finally I settled on roasting them. I’m not sure that I would really call this a recipe but instead more of a technique. Once I took them out of the oven I couldn’t help but try one and oh my goodness, they are truly a million times better than anything you buy in the store, they are irresistible. I had to summon all my will power to keep from eating these by the handful. I understand turning on your oven in the middle of the summer is probably the last thing you’d like to do, but believe me it is so worth it. Turn it on after the sun goes down and let them roast while you are relaxing on the couch--I promise you won’t be sorry. Preheat oven to 250 degrees F. Line a baking sheet with aluminum foil or parchment paper. 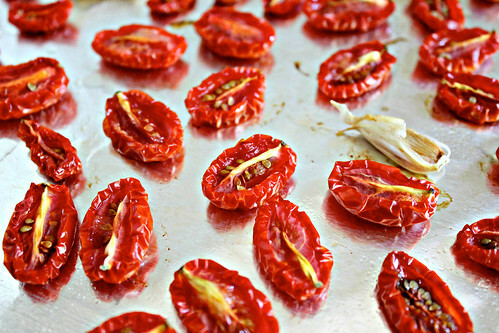 Halve each tomato and place on prepared baking sheet. 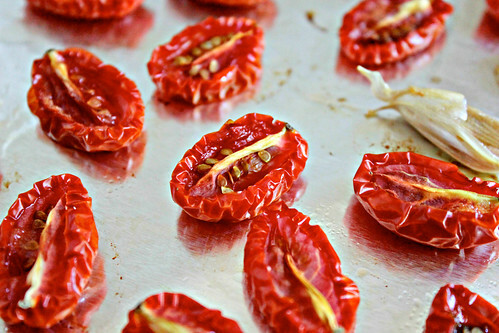 Place garlic on baking sheet as well and lightly drizzle tomatoes and garlic with olive oil. Bake for approximately 2 and 1/2 hours or until tomatoes look dry and shriveled but still have a little juice on the inside remaining. After tomatoes and garlic have cooled, transfer to an airtight container and drizzle with more olive oil to prevent them from drying out (I stored mine in a mason jar). Enjoy!